From the critically-acclaimed author of The Day, I Died comes a terrifying twist on a locked-room mystery that will keep readers guessing until the last page. 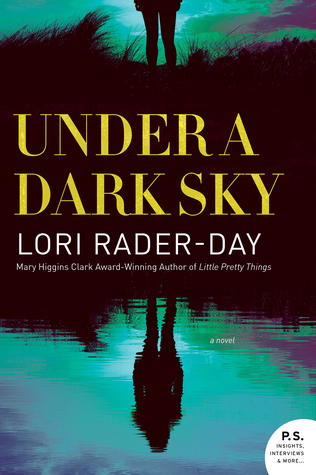 About the author: LORI RADER-DAY, author of Under a Dark Sky, The Day I Died, The Black Hour, and Little Pretty Things, is the recipient of the 2016 Mary Higgins Clark Award and the 2015 Anthony Award for Best First Novel. Lori’s short fiction has appeared in Ellery Queen Mystery Magazine, Time Out Chicago, Good Housekeeping, and others. She lives in Chicago, where she is the co-chair of the mystery reader conference Murder and Mayhem in Chicago. My Review: Under a Dark Sky is a nail-biting, spine-chilling read that is sure to keep you up at night. This fast-paced read takes you along for a suspenseful read as you follow several friends who find themselves in the middle of a murder. Who is the suspect and why? Rader-Day has written a captivating read that progresses perfectly making you question every motive. Every suspect seems to have a different motive. Who was the killer? Under a Dark Sky will have you unsure of what is lurking beyond the next page, next chapter. Every character has a hidden secret and a dark backstory that slowly comes to light that unfolds at just the right time to make this a thrilling read. You will enjoy the character building of each character and their personal backstories. A storyline of “who done it” that keeps you guessing and second-guessing.